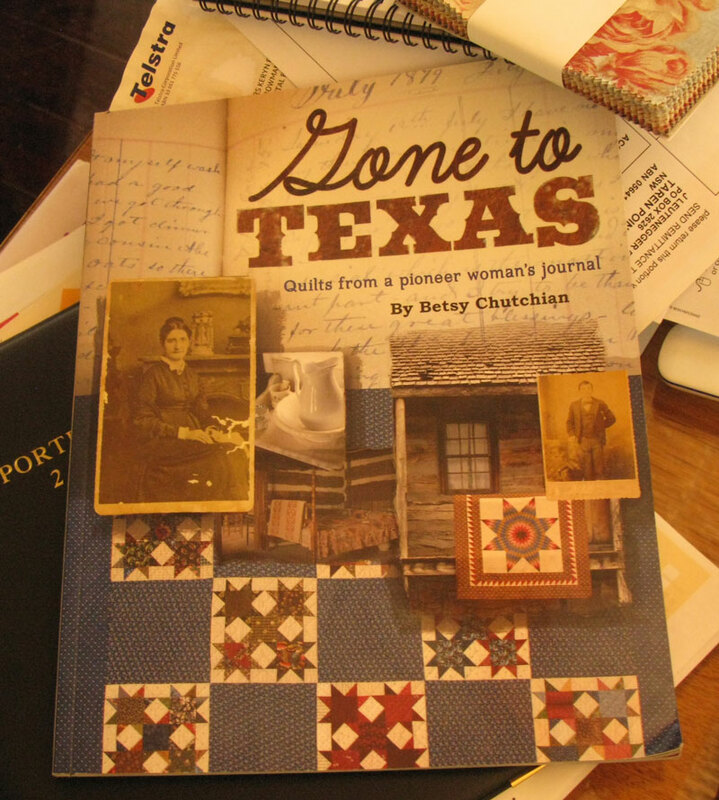 We raced into town the other day to pick up a few necessities, and somehow managed to pop into the patchwork shop. Dearie me, how come this came home with me? I know I've sworn off jellyrolls forever, but I wanted some of this Civil War Reunion, and this was the quickest way to get it. Mereth was scoffing at my weak resolve, but she was very quick to accept the gift of a couple of duplicate strips in the batch. I can see yardage of this fabric line being purchased in the not-too-distant future. 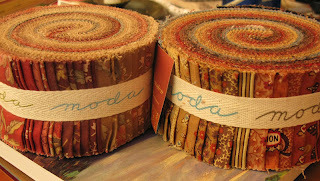 The other jellyroll is Antique Fair, and I purchased that from an Ebay seller. It will work in very well with some other precut lines that I have, so I'm hoping that now I officially have 'enough' to be able to start a project with them. I'm still shifting furniture around in my living quarters, trying to find the perfect setup, and it's starting to feel very cosy and homely. 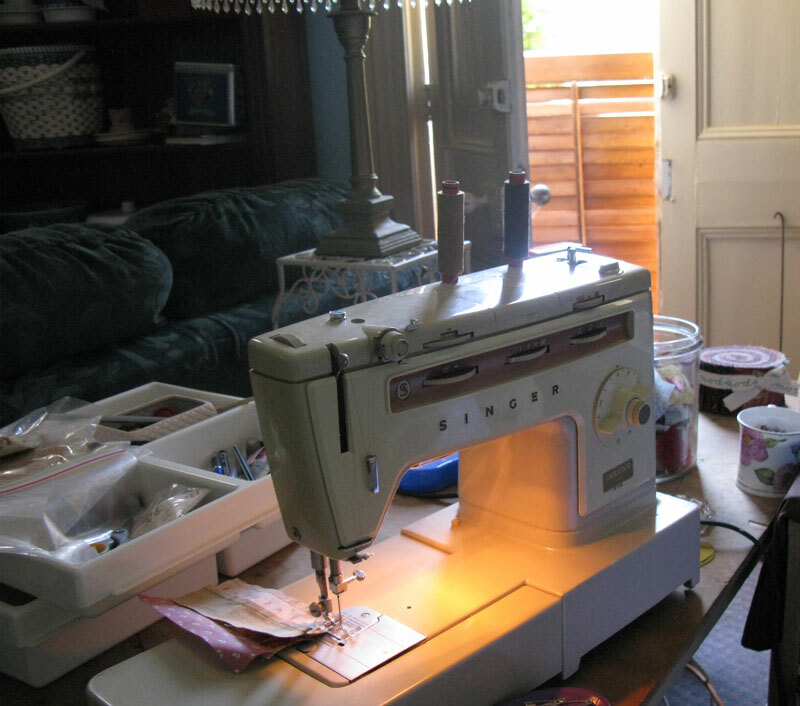 My sewing space is just about done, and all I have to do now is sort out my projects and boxes and find a permanent home for it all. I like that sort of fossicking and rummaging though, so I'm looking forward to it; I imagine I'll find a lot of things I forgot I ever had once I get into it. 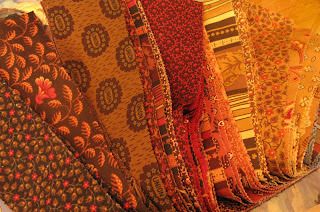 I'm still cleaning up strips, and making crumb blocks, but I will have to start working on a good quilt soon, just to take advantage of all the lovely fabric in the stash. 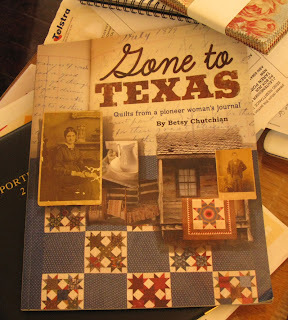 I treated myself to a few books over Christmas, including Gone To Texas, by Betsy Chutchian. I have so many fabrics for these two, just crying out to be used. Would it be wrong to start both? A few hot days have seen me have sent me to the sewing room, escaping the heat and being productive. 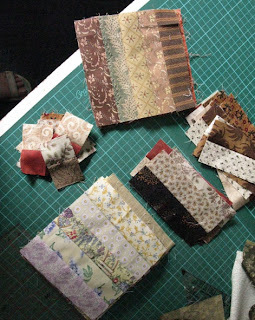 I'm enjoying the 1.5"strips, so much so that I relieved Mereth of her spare strips, and now have an ocean of little pieces all over the table. 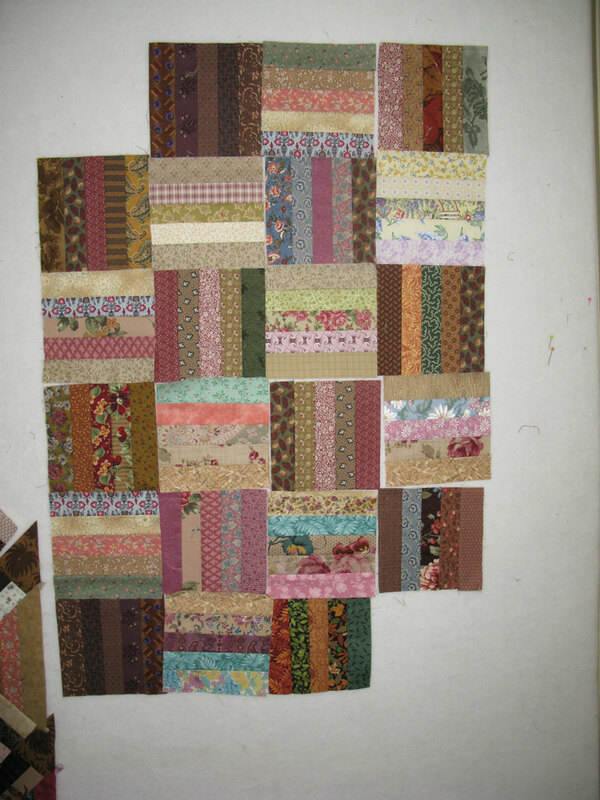 I've used up 3 small drawers full of scrap strips, and I refuse to cut more from the stash, so it may be time to move onto something else. 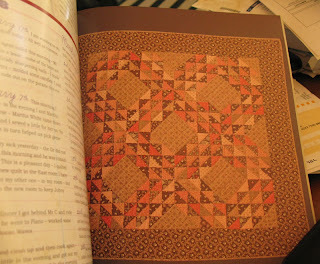 I have one top completed up to the borders, which I didn't take a photo of, so that will have to wait till later . 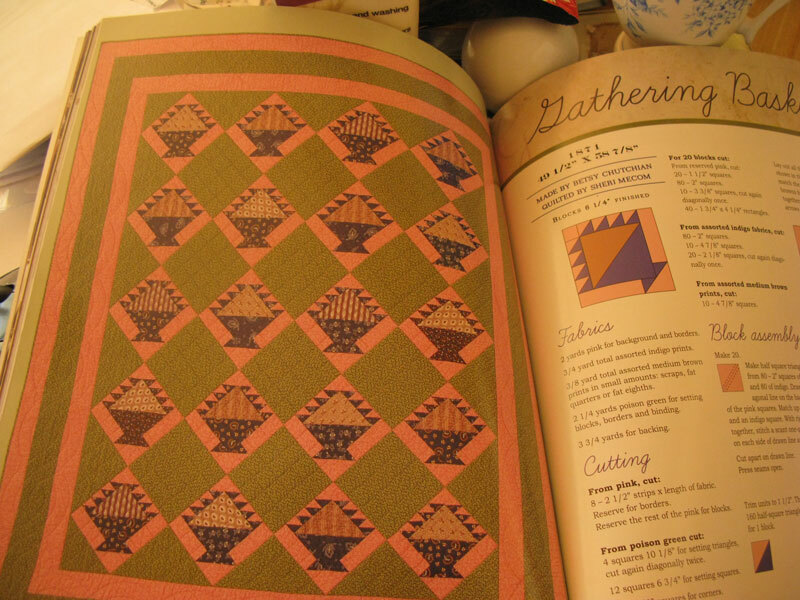 I decided that it was too much effort to choose a single fabric for the setting triangles, so I strip pieced those as well. It took a bit of time, but it was very easy and I like the look of it. 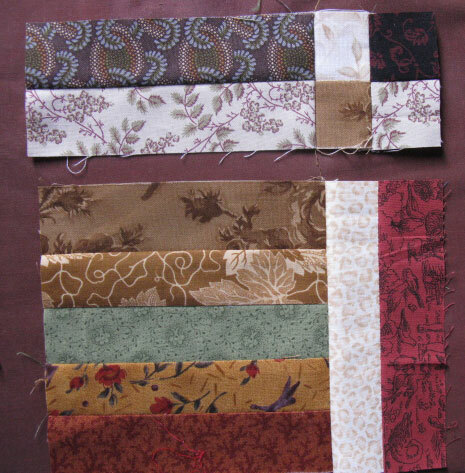 I have lots of these 5.5" pieced squares left over, so they are the beginnings of another quilt. I love the simplicity of them, both in the making and the final effect. 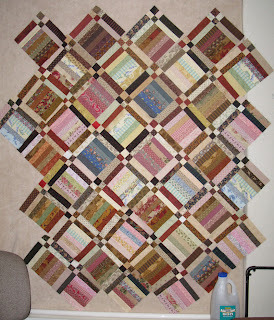 I haven't decided if I will set these in a simple basketweave like this, or maybe use them as units of a bigger block. There's plenty of time to choose. 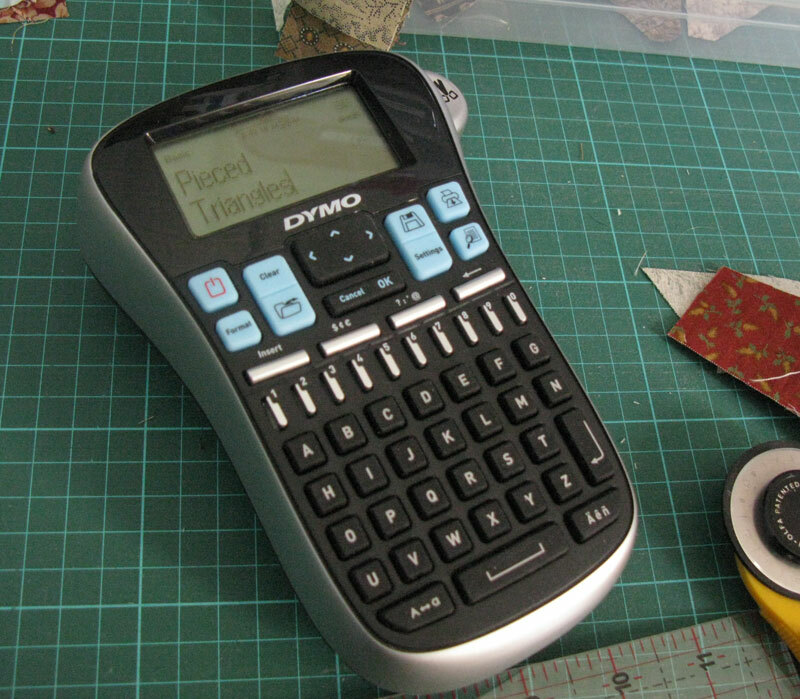 For months I've been wanting a labeller, and boring Mereth with stroies of how my life would be different if only I could label everything. Lo and behold, for Christmas this showed up under the tree. What a great gift, and one I truly wanted. I'm enjoying getting more organised, and I'm sure that once everything is sporting it's own little tag then life will suddenly become much easier. Is that an unreasonable expectation? This is the current state of my strippy blocks, and I think I'll make another 20 or so , to make a large single bed size. It will be a donation quilt, to go the Queensland flood appeal. Lots of groups are making raffle quilts to raise money, so that might be where this one goes, or I might donate it to someone who needs it. My daughter lives in Emerald; it wasn't that long ago that they were in severe drought, and the dam was empty. Now they are recovering from a flood where 80% of the town went under water. Talk about a land of extremes. She's still a bit shocked that her house was one of the few that didn't get flooded, luckily. I've been involved with a little fundraiser of my own, with the computerised quilting lists that I'm on, and we have raised nearly $3000, which is absolutely fabulous. It's good to be able to make a contribution, no matter how small. I 'd like to echo Bonnie's sentiments in this post, about how you can give to the Premier's Appeal. A lot of the places under flood are places I've lived, including the Lockyer valley where I went to Agricultural College. It hurts to see such devestation wreaked on an area of beautiful, productive farmland. I haven't had a lot of free time, so not much more sewing has taken place, but for my own sanilty I need to get back to my machine. 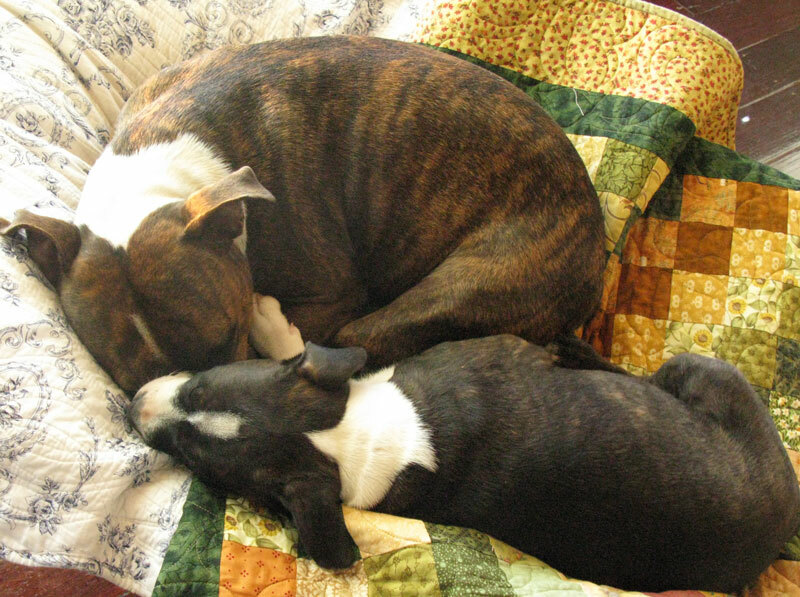 Dolly and Pippi know the antidote for stress; a comfy bed in a patch of sunlight, and a quilt to snuggle on. 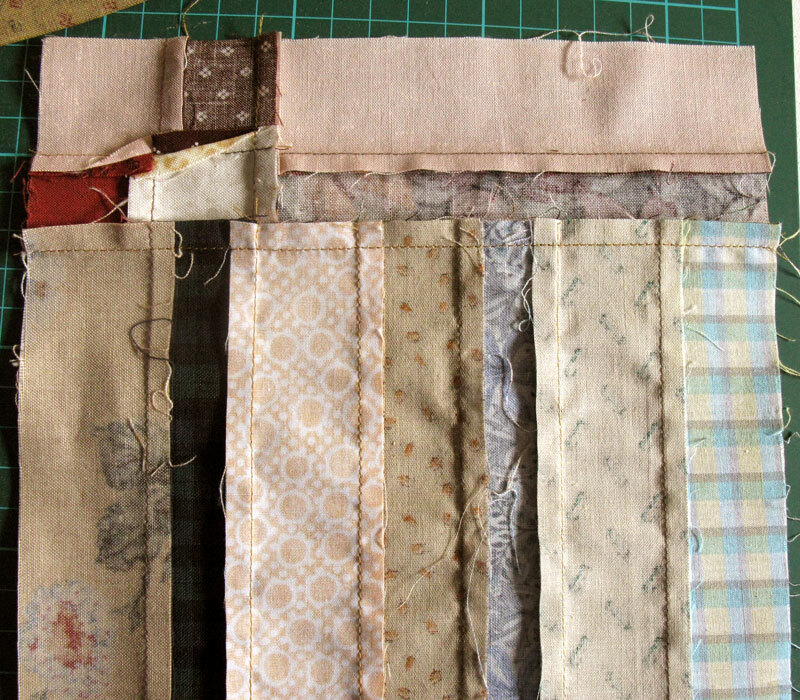 I've done a little bit of sewing in amongst other chores, but not as much as I could have. These scrap blocks are fun and easy, but the seam allowances of adjoining blocks were clashing, and I was too lazy or distracted to work out how to press them to avoid that. And that was stopping me from sewing more of them. The best to do was to take photos for a tutorial, so that I can refer back to the blogpost whenever my fickle memory forgets exactly what I did. 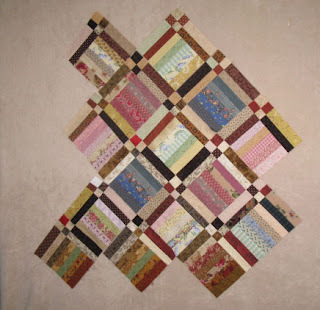 I could always refer back to the correctly pressed blocks, or I could do what I did in the past and copy the pressing of an incorrect block too many times to count and have a dreadful mess to deal with later. The blogpost is the sensible option. There are two blocks with the values in opposite places, what Mereth and I refer to as Counterchange blocks. Both are laid out a little differently, and pressed differently. But they all start out with these basic units. 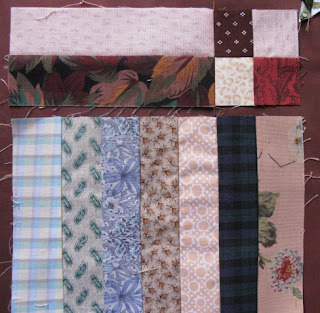 I sew most of my longer 1.5" light medium strips into pairs, and then sew those pairs together to make a pieced strip 4.5" wide. I cut those into 5.5" slices, and add a fifth strip, 1.5" x 5.5". That allows me to use up all shorter lengths of strips. I do the same with all the dark medium strips. It doesn't matter what way the seams are pressed in these units. The aim is to have a 5.5" pieced square. The dark and light strips are sewn into pairs, seam pressed to the dark fabric; then they are cut into 5.5" slices. 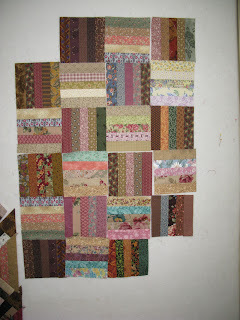 At then end of the strip, when there isn't enough room for another slice I cut 1.5" pieces, and these are paired together to make fourpatches. The fourpatches are pressed like this. 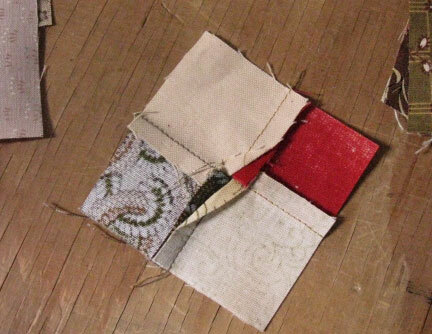 I lay out the light blocks like this, and sew the fourpatch to the light/dark rectangle, seam pressed away from the fourpatch. 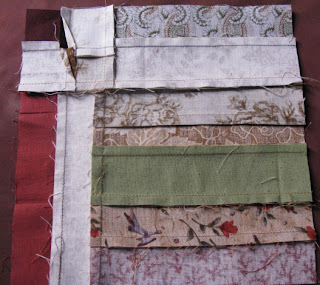 A light/dark rectangle is added to the side of the strip-pieced square, seam pressed to the dark. See how the strips in the square are aligned vertically? 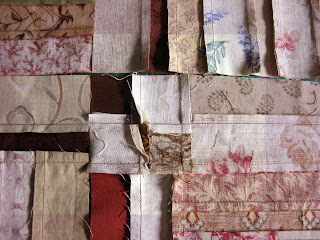 Sew that final seam through the block, and press it towards the dark strip. It will want to do that anyway, because all those seam intersections don't want to press back on themselves. 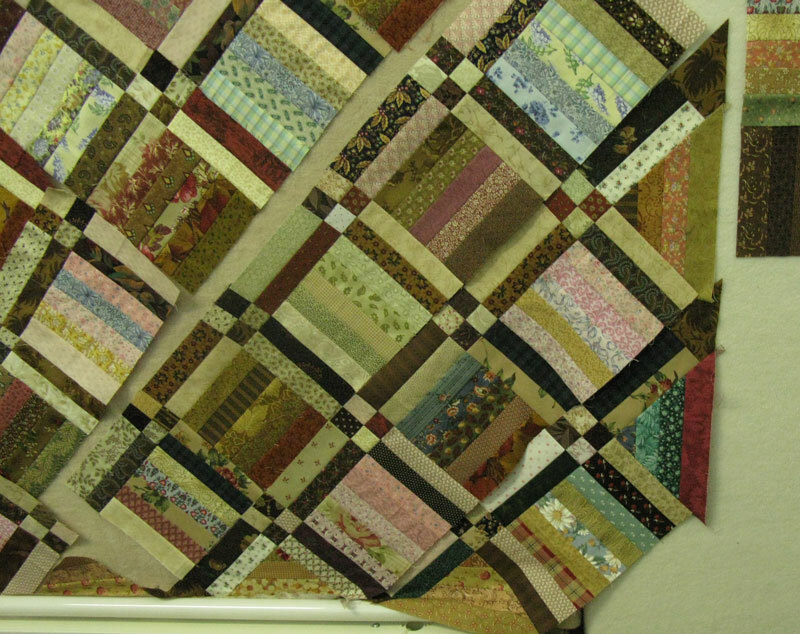 Lay out the the dark square as shown; the strips in the pieced square are horizontal. Sew the units together as in the other block, seam pressed away from the fourpatch, and away from the pieced centre square. Sew the joining seam, and press it down towards the pieced square. 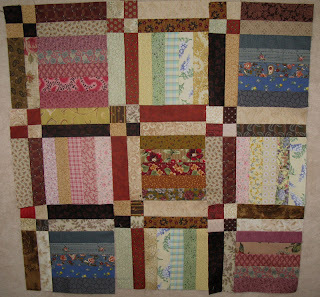 If all the blocks are made and pressed like this, they fit together without a hitch, all the seams nested together. That makes me a lot more enthusiastic about getting on with the project. 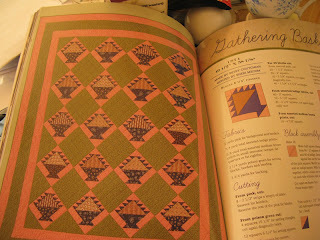 The photos are crappy, taken late in the afternoon with bad lighting, but they will have to do. I'd rather spend today sewing than taking decent photos. Oh and it's going to be on point now, because everything looks better on point. Now that I look at it, some of those strip squares are oriented in the wrong direction. It doesn't matter a bit, except that those blocks won't play nicely with their neighbours when it comes time to join them. 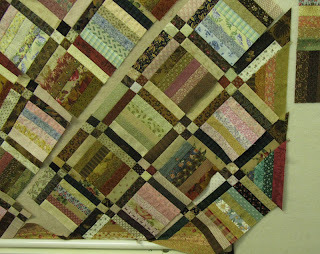 I don't mind mashing a few bulky seams flat, but a whole quilt like that is daunting. I'd rather take the time to work out a system and stick to it, even if I have to do a tutorial to remember. 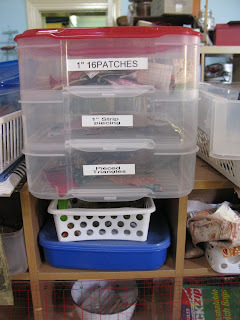 Now if I could just remember where I put my Ott Light, and my hand-piecing supplies. 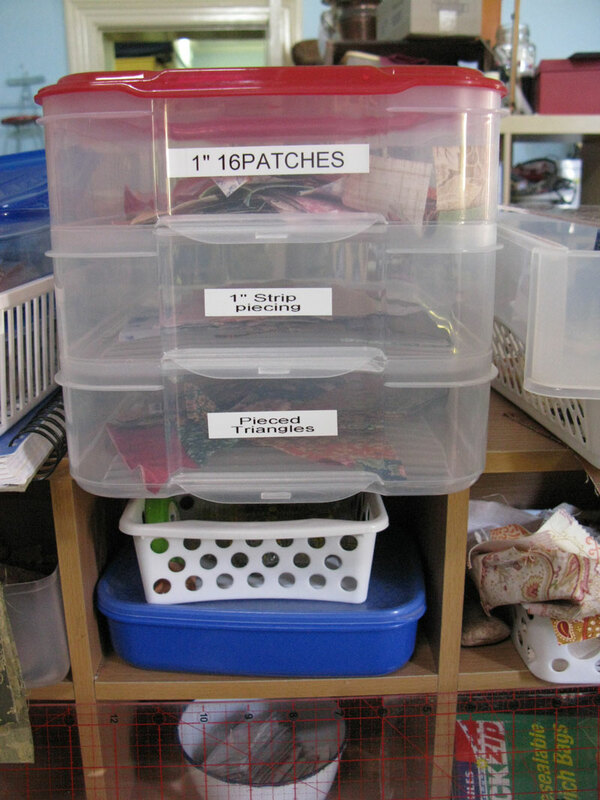 and my Etui sewing box, and my other box of 1.5"strips. I thought we were being so careful when we moved here, but that last flurry of packing the presious stuff was done in an unsound state of mind. I have no idea where some things were stowed, and it will be a voyage of discovery to track them down.